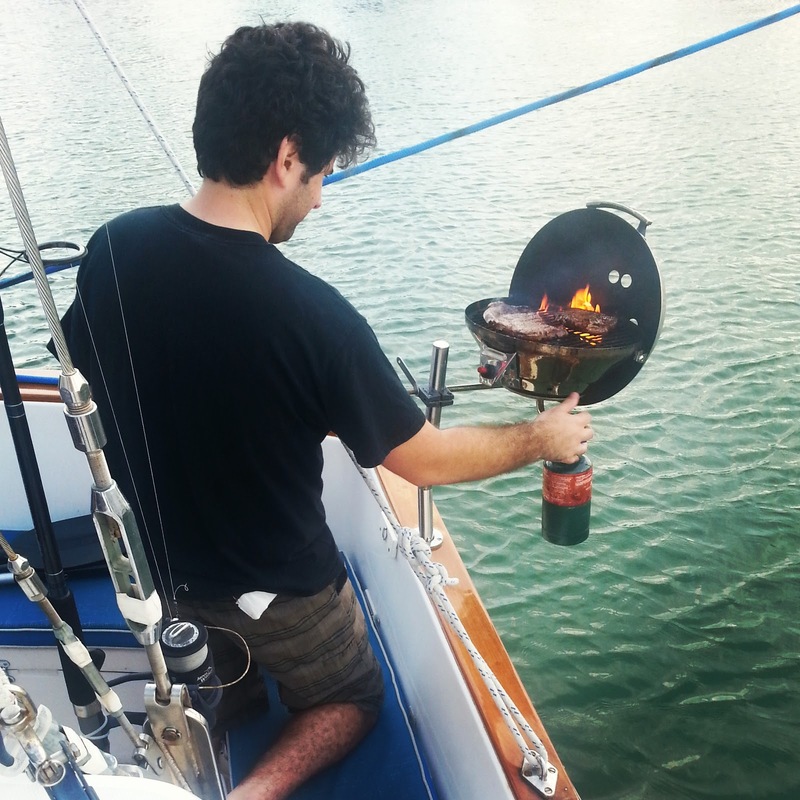 Down here in Florida, it is difficult to find a boat--power or sail--without a small propane grill attached to the stern rail. When it is nice outside (which is pretty much all the time), grilling dinner on the aft deck is a nice way to spend an evening. Since Sea Gem has an aft cockpit instead of an aft deck, we have the added comfort of seats and plenty of space to put food, utensils, etc., while grilling. Unfortunately, the propane grill that came with Sea Gem never worked that well (one setting: blast furnace), and it finally grilled its last meal (poorly, I might add) a couple months ago. Since then, we've been on the lookout for a new grill. 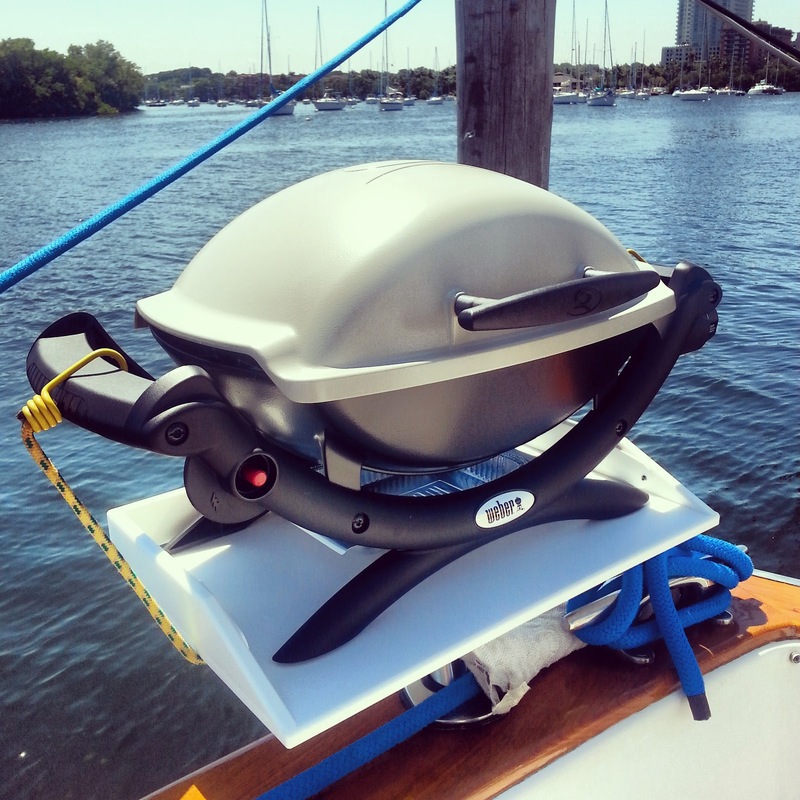 The simplest solution was to get the same kind of grill we had before--a stainless steel kettle-style grill made specifically for boats. There are two companies that specialize in marine grills, and as far as I can tell, they both build grills with the exact same three characteristics. First, they are constructed of polished stainless steel, and they look shiny and nice. Second, they are expensive compared to ordinary grills, as are most marine-specific products. And third, they don't work nearly as well as their land-based counterparts. Pretty much the same value proposition as an expensive designer watch that doesn't keep time. Although the argument for the higher price, I suppose, is that they are built to last longer in the marine environment, I am doubtful. Between our last grill and similar grills we have used in the past, they begin to deteriorate rather quickly. 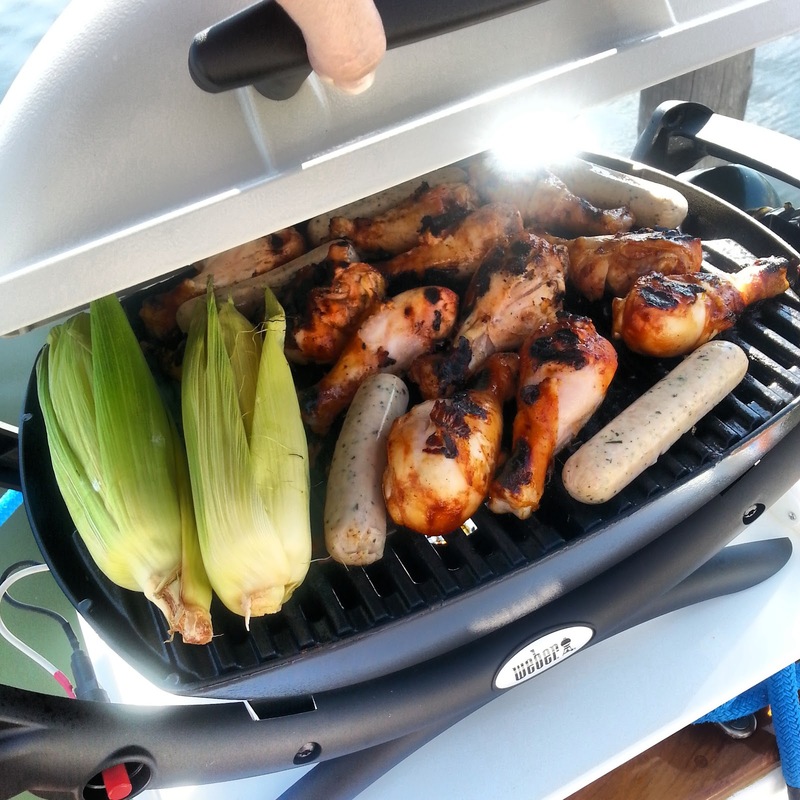 Once we started looking for a new grill, however, we quickly noticed that several boats at our marina are now using compact Weber Q grills instead of the stainless steel marine models. The stainless grills remain the most popular, but we figured that the Weber folks had to be onto something. The Weber Q is very highly rated (as a grill, not a decoration), and at half the price of the marine models for the same size, we figured that even if the Q lasts only half as long in the marine environment as the stainless grills, at least we'll have a more functional grill during that time (and still break even after buying the replacement). 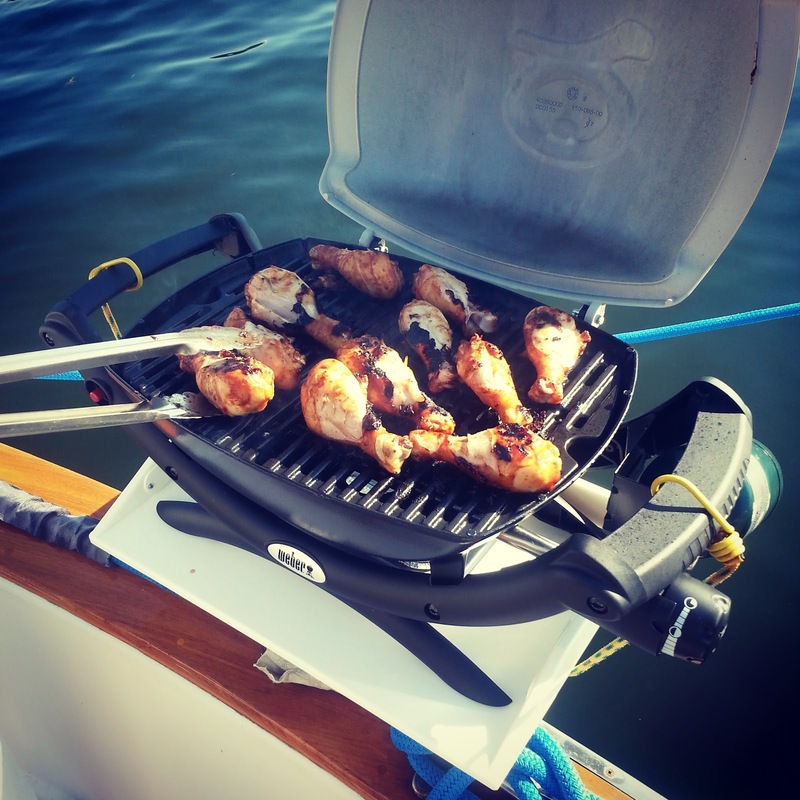 The Weber is not designed to simply bolt onto the back of a boat like the marine grills, and so a little improvising was in order. As it turns out, the Weber (this is the smallest one, the Q100--still big for a boat grill) fits perfectly into the 20" Magma cutting board, which fits right into a fishing rod holder and is very sturdy. The cutting board has tall fiddles to keep the grill in place, but we added a bungee cord just in case, and the result is quite secure. We had out first cookout on the Weber earlier today, and it proved to be far superior to our old marine grill. The flame can be reduced from blast furnace, the entire grill surface heats evenly (no cold spots like the old grill), and the meat stays juicy and delicious. It may not shine brilliantly in the sun, but our new grill is a good grill, and isn't that all that matters?